Sabrina’s back for season 2, and she has fully embraced her witch heritage (and some seriously dark lipstick) for this season. Now a full-time student at the Academy of Unseen Arts, odd events set our favourite Spellman on the path to her dark destiny, with the Dark Lord and Lilith (Michelle Gomez) coaxing her along the way. I won’t say much more for fear of spoiling the series, but rest assured that The Chilling Adventures of Sabrina season 2 is largely focused on the witching world, with few sojourns into the struggles of everyday teen life, unlike The Chilling Adventures of Sabrina season 1. Unfortunately the series suffers because of this, as Sabrina (Kiernan Shipka) is at her best when she’s fighting off the confines of school, bullies, and Father Blackwood (Richard Coyle) rather than going head-to-head with the Dark Lord (Luke Cook). While big events overwhelm most of the series, there’s still dazzling performances to be seen from almost all of the cast, plus a few character arcs that will have you cheering from your sofa. Like I did. Loudly. I’m going to get the bad bit out of the way right now: Kiernan Shipka is fantastic as the tenacious, curious, and brave Sabrina, but her performances fall flat when she’s forced to be outright intimidating. By leaning too far into the witch’s bellowing, vocally vengeful side Shipka fails to impress, as much of her acting shines when she’s able to indulge her cunning tendencies and argue with razor-sharp wit. Now that’s out of the way, know that this is just one of the two pitfalls of season 2, with the second being that near the end of the series events ramp up catastrophically quickly, leading to the season as a whole feeling a bit uneven. But hey, that’s the bad out of the way. Now let’s focus on the good - because there’s a heaven of a lot of it. Michelle Gomez as Lilith is the stand-out star of this series (sorry, Sabrina). Praise Satan that she’s given more screen time, as the episodes dig deep into Lilith’s relationship with the Dark Lord and, by doing so, lets her finally decide what she wants rather than fawning over the Dark Lord’s every command. If you delight in a well-paced character arc, trust me: Lilith's is the one for you. Gomez is able to switch between her delicious appetite for plotting and genuine heartbreak incredibly quickly without it being jarring, making me feel way more attached to Satan’s handmaiden than I probably should. Gently coaxing and prodding from the foreground this time around rather than being confined to the sidelines, Lilith is a crucial part of season 2 and Gomez makes her appear evil without the character ever coming across as two-dimensional. Not ashamed to admit that I’d probably start a coven to worship her if I could. Season 2 flings down even more character arcs and you’ll be there to gorge on every single one, as it pushes Ros (Jaz Sinclair), Theo (Lachlan Watson) (previously known as Susie), Hilda (Lucy Davis), Zelda (Miranda Otto), Nick (Gavin Leatherwood), and Prudence (Tati Gabrielle) into new and profound roles in the Witching world. Tati Gabrielle’s Prudence deserves the most recognition here, as Gabrielle shows us just how much desperation hides underneath Prudence’s proud facade without making her character appear too subservient to the misogynistic Father Blackwood. Most of these a-ha! moments belonging to each character is just a brief scene, but every performance is exquisite and makes it clear that Sabrina isn’t the only one with problems that overshadow most of her daily life. I’m also going to include a special mention to how well the season handled Theo’s transition to boyhood, which was given the time and respect needed for such an important development. Later on in the series, Theo batted away any ill-judged comments from other characters with eloquence and certainty, standing his ground. It’s truly a testament to the show’s writing that Theo was given the space to grow and confront everyone about his transition, from the boys at school to his own father. And yeah, it made me cry a bit. With Harvey almost out of the picture, there’s a new boy in town, and it’s the talented warlock Nicholas Scratch (Gavin Leatherwood). While the character becomes slightly sidelined towards the end of the season, when he does feature Leatherwood excels at depicting the warlock’s fascination, and eventual devotion, to Sabrina. Constantly supportive, he’s not some simple charming rival to Harvey either, as his own insecurities and dark past come back to haunt him… as they would in a world where magic has a tendency to bring out the worst in people. It’s a tricky job to make someone feel like more than the third piece of a love triangle, but Leatherwood executes his role with ease, having Nick reflect not only the strict, almost snobbish attitude of the witching world but also expose its corrupt underbelly through the horrific things this Warlock has had to do. 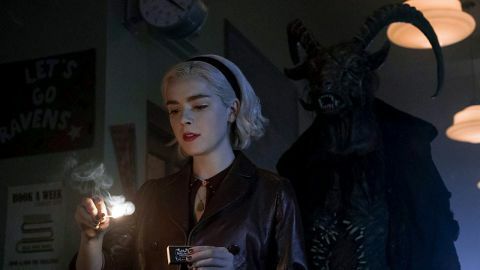 Overall, The Chilling Adventures of Sabrina season 2 is well worth watching, but trips over the high expectations it sets itself in the first handful of episodes. Aside from that, it’s a visual delight and it will make you either wish you could attend Baxter High or sign the Book of the Beast for yourself. After more entertainment delight? Here’s the best shows on Netflix you should be streaming right now, or give the video below a watch to see them for yourself!